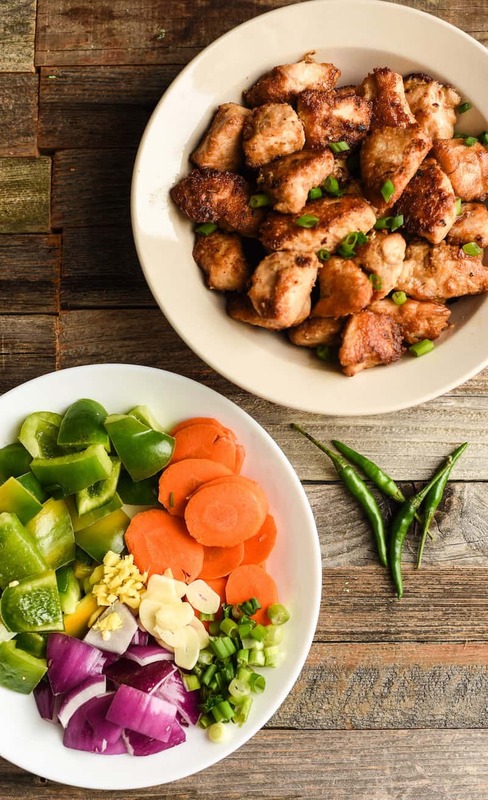 If you’re a huge fan of Indo Chinese food, this chilli chicken recipe is going to be one of your favorites! It’s perfectly spicy and really easy to make. One thing that I miss about Atlanta is the diversity, both in the people and in the cuisine. I miss ALL the delicious restaurants that Atlanta has to offer, especially the Indian and Chinese food. Strangely I’m not really a fan of highly curried dishes, but I do like spicy and I love chicken and rice. 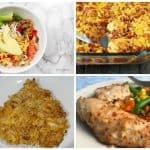 Which brings me to my chilli chicken recipe. If you’ve never had chilli chicken before, you’re going LOVE this Indo Chinese dish. 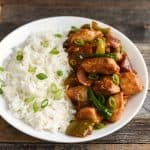 This easy chilli chicken recipe combines the chili garlic flavors of Indian food with the ginger and soy sauce from traditional Asian dishes. 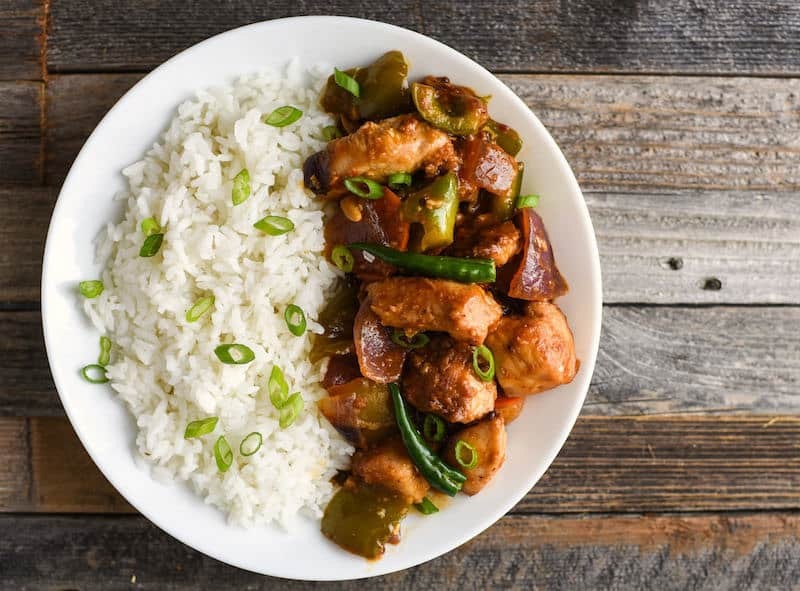 The flavor is truly magical, and this Indo Chinese chicken just melts in your mouth! 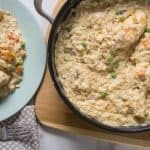 I said this chicken recipe was to simple to make, and I meant it. You’re going to do some chopping (if you want to add the veggies, which I highly recommend. You can really add any veggies you like. Just make sure not to overcook them; part of what I love about this chicken dish is when the veggies are cooked but just a little crisp. 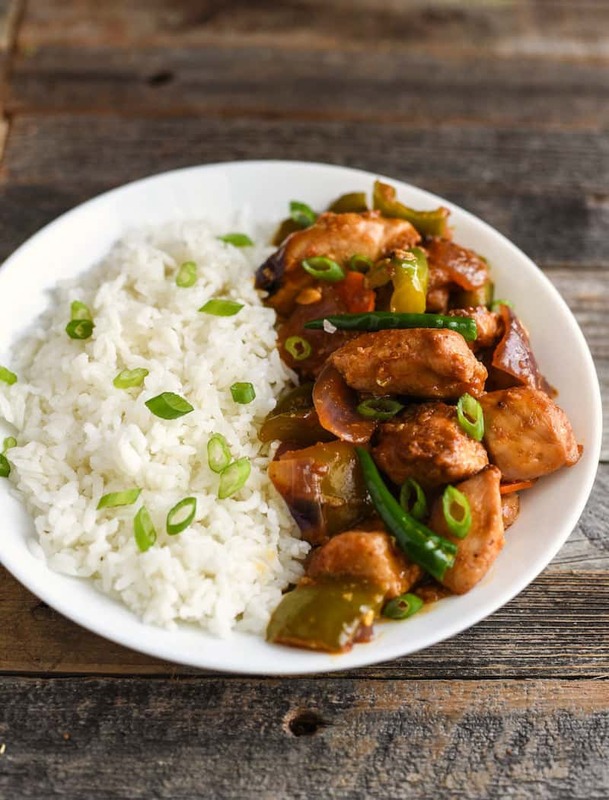 This chilli chicken dish pairs well Jasmine rice and you can also make brown rice if you are trying to be a bit healthier. And now that I mention it, I’m wondering what it would taste like on a piece of Naan? I’m going to have to try that! I’ve always had good luck with the Huy Fong brand for my chili garlic sauce. They also make Sriracha sauce in the squeeze bottle with the green lid that you probably recognize. I find the Sriracha sauce to be a little less viscous than I’d like. Then I love the garlic flavor in the Huy Fong sauce as well as the amount of spice. It’s just perfect for me (I like spicy but not burn your mouth). 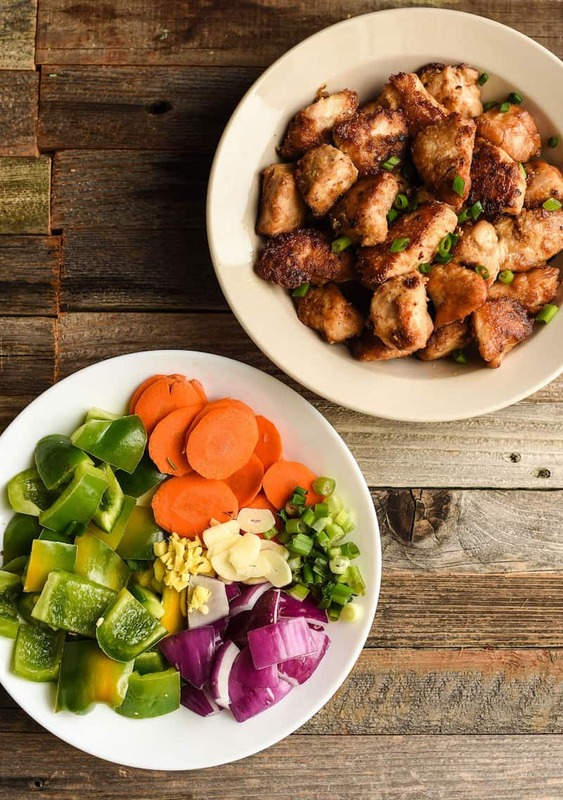 As far as soy sauces, I’ve always liked dark soy sauce versus light – and I recently found out that darker soy sauces tend to be thicker and have less saltiness! That’s probably why I always end up adding extra salt to my dish :0. You won’t need to add any salt to this chilli chicken recipe. It’s just perfect flavored! 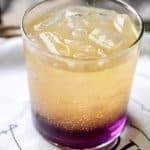 Try the recipe below. 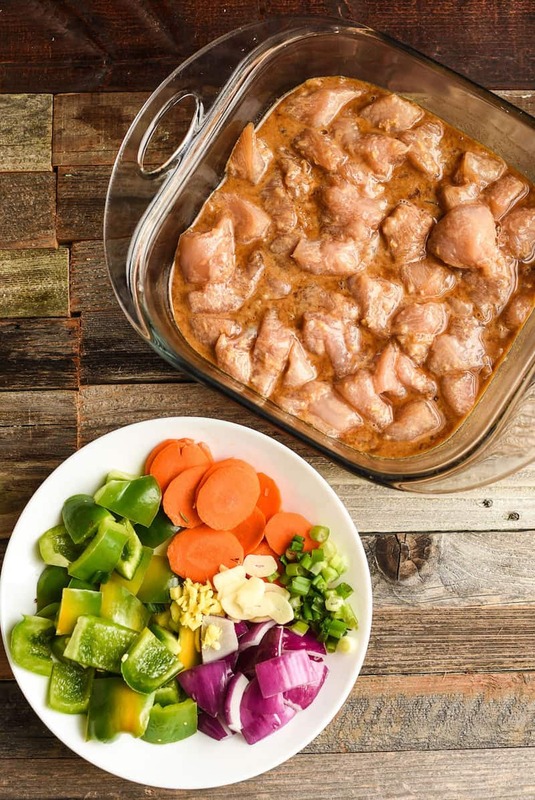 In a bowl, whisk together all ingredients under “Marinade.” Place the chicken pieces in the marinade and place in the fridge for one hour. Heat enough oil in a wok, then fry the marinated chicken pieces till golden brown (on all sides), about five minutes. Transfer to a paper towel-lined plate. In another pan, heat 1 tablespoon of oil and fry the chopped ginger, sliced garlic, chopped green onions, and green chilies. Optional if using vegetables: once fragrant, add in the onions and green bell peppers and fry till the onions turn slightly translucent, about 7 minutes. Add in the carrots and chicken pieces and toss to mix. In a bowl, mix together soy sauce, chili garlic sauce, ketchup, chicken stock and 1 tablespoon corn starch. Add it to the pan, and cook till the sauce thickens and coats the chicken pieces, about 3 minutes. Serve with rice or some other carbohydrate. Heat enough oil in a wok, then fry the marinated chicken pieces till golden brown (on all sides). Transfer to a paper towel-lined plate. 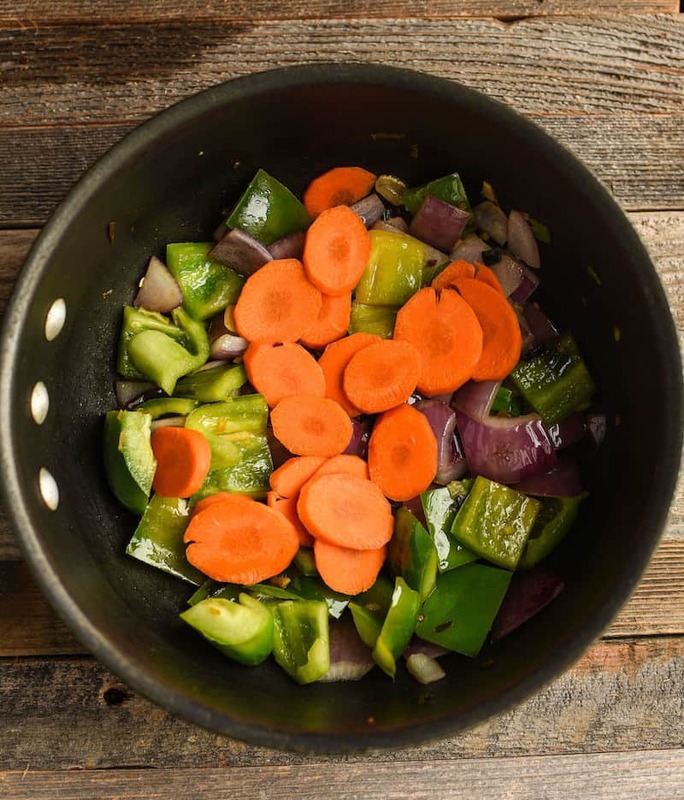 Optional if using vegetables: once fragrant, add in the onions and green bell peppers and fry till the onions turn slightly translucent. Add in the carrots and chicken pieces and toss to mix. In a bowl, mix together soy sauce, chili garlic sauce, ketchup, chicken stock and 1 tablespoon corn starch. Add it to the pan, and cook till the sauce thickens and coats the chicken pieces. 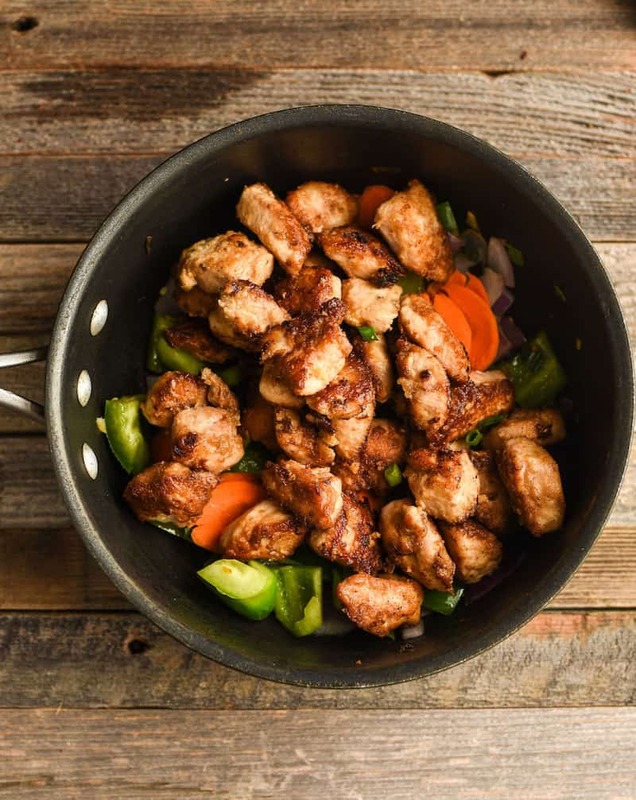 Would you try this Chinese chilli chicken recipe? I’d love to know if you’d make it in the comments! 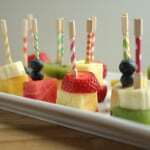 I am going to make this over the weekend. It looks so good. Thank you for sharing. We are a family of 6 and the kids are going to love it.